Radiation Therapy as a Cause of Heart Disease! How can radiation therapy cause heart disease? RADIATION therapy is a powerful tool for improving the survival rate of those diagnosed with certain forms of cancer. But the dozens of doses of high-energy radiation involved carry a risk, as healthy cells are zapped along with cancerous ones. Many short-term and long-term consequences are well known, including an increased risk of developing new cancers decades after successful treatment. But improvements in early diagnoses, chemotherapy and surgery (as well as, lately, immunology) have combined with radiation to produce larger numbers of cancer survivors living beyond the ten-year mark from the end of treatment. This has brought a previously suspected link into sharper focus: radiation-induced heart disease (RIHD). On July 16th a study called for higher level of cardiovascular screening in cancer survivors. But how can radiation therapy cause heart disease? Oncologists use radiation, typically X-rays, to fight cancerous cells for many forms of the disease. The therapy may be used to destroy or shrink tumours, to halt malignancies, to reduce the odds of recurrence or to reduce the severity of the disease. Cancer cells tend to divide rapidly and often uncontrollably. Radiation causes the most harm to cells in the process of division. Bodies are remarkably resilient, however, and despite often challenging short-term effects, tissues recover and long-term damage in those that avoid the recurrence of cancer is often minor. However, the heart has been found to suffer the most, particularly with radiation to the thorax or mediastinum, the central part of the thoracic cavity. After radiation, the heart’s efforts to repair itself appear to lead to thickening and calcification of tissues and inflamed arteries. This, in turn, substantially increases the risk of heart diseases, including atherosclerosis (thickening of the arteries), pericardial disease (damage to the heart’s surrounding membrane) and congestive heart failure. Certain chemotherapy drugs may exacerbate some effects as well. Suspicions that radiation therapy led to increased risk of heart disease date back to the 1970s. The British Medical Journal examined evidence in 1976 and dismissed concerns as minor. But the number of long-term survivors of cancers treated with radiation near the heart—notably Hodgkin’s Disease, breast cancer and lung cancer—only began to swell in the 1990s, providing more data to study. A 2007 review by the American Society of Clinical Oncology put the incidence of some form of RIHD at between 10% and 30% by five to ten years after treatment. 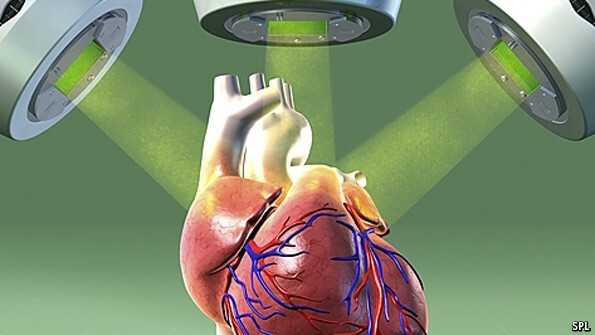 Now the European Heart Journal – Cardiovascular Imaging and the Journal of the American Society of Echocardiography have recommended that the link between radiation and heart disease is clear enough for oncologists and cardiologists to carry out heart checks on patients undergoing radiation therapy. Before the therapy begins, they say, tests should establish a patient’s cardiovascular health; immediately after, tests should determine the extent of any short-term damage. Oncologists and general practitioners should look out for symptoms in the years that follow, even if deemed unlikely because of age or the absence of other risk factors. High-risk patients should receive non-invasive echocardiographic (sonogram-like) screening at five years following radiation, says Patrizio Lancellotti, chair of the group that produced the recommendation; others, at ten years. The recommendation may be enough to send former radiation patients scurrying to their doctors. Patients face an unappealing choice: have radiation therapy and risk later getting heart disease; avoid it, and reduce the chance of surviving cancer. But the news is not all bad. Some forms of heart disease, notably atherosclerosis, appear to be far more common when radiation therapy is coupled with other risky behaviour, such as smoking or having a fatty diet. That knowledge may steer younger patients into healthier lifestyles. Catching problems earlier with screening can prevent medical or surgical interventions. Conventional cardiac therapies work for cancer survivors as well as the general population, even though the need comes earlier in life or for otherwise atypical sufferers. The best news of all is that because of the increased concern decades ago about RIHD, radiation therapy was modified to reduce energy to the heart both in intensity and by using shielding to limit the area exposed. As a result, researchers expect that even as the pool of cancer survivors who received radiation therapy will grow, the percentage suffering from related heart disease should shrink. Scientists Announce The Cure For Cancer May Live In The Intestines: Hogwash Or Hope For The Future? This entry was posted in Cancer, Cryoablation, Kidney Cancer, Magnetic resonance imaging, Surgery, Tumour and tagged American Society of Clinical Oncology, Cancer, Cardiovascular disease, Economist The, GL-W, Greg Lance-Watkins, Greg_L-W, Heart Disease, Heart Disease Radiation Induced, Hodgkin's lymphoma, Radiation Induced Heart Disease, Radiation therapy, Radio Therapy, RIHD. Bookmark the permalink.